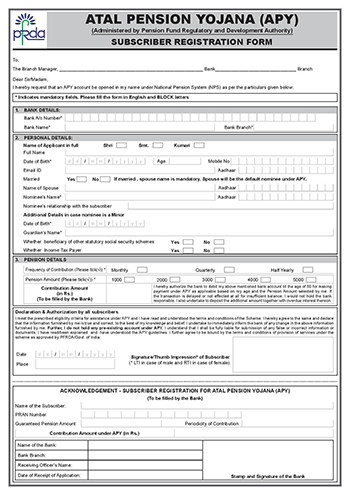 Pradhan Mantri Atal Yojana 2019 APY Complete Details Apply APPLY Scheme Online:- Atal Pension Yojana has Introduced by the Government of India as it is Named Atal Pension Yojana in the Month of June 2015. The Atal Pension Yojana is totally Depend and Administrated by the PFRDA Pension Fund Regulatory and Development Authority that works under an National Pension System NPS, This Atal Pension Yojana main Aim is to Encourage the Individuals from the below Poverty People and the Weaker Section for the Eligible of Atal Pension as it which would immensely benefit them in during their Old Age as after Crossing their Age of 60 Years. The Atal Pension Yojana Scheme can also be taken by the Individuals who are working in the Private Sector Departments or by anyone who is Self-employed. As this Pension Scheme will help the Weaker Sections to Save their Age and Get a guaranteed Monthly Pension amount til He/she Passes away, Under this Atal Pension Yojana the Candidates will receive a Fixed Pension after the Age of 60 that Depending on his contribution and tenure. This Atal Pension Yojana has Named after the Ex-Prime Minister of India Atal Bihari Vajpayee, Atal Pension Yojana is also Known as APY Scheme that which was launched in Continuation to the Prime Minister of India Narendra Modi’s Jan Dhan Yojana Scheme that to Bring those Candidates who to bring the Employed in Rural and Unorganized Sector Under the ambit of Pension Schemes. This Atal Pension Yojana Main aim is to Provide an immense and Definite Pension to all the Indian after they Complete the Age of 60 as Senior Citizens. Moreover, You can get the Pension that during Your Old Age that needs to Contribute accordingly. The More You can Contribute and the more Pensions that you would get during the Old age, The Atal Pension Yojana Scheme is backed by the Ministry of Finance, Government of India. The PM Atal Pension Yojana Scheme that would be working under the Unorganized Sector. The Candidates who wants to apply for the Atal Pension Yojana Scheme that they must be an Indian National that within the Age Group of 18 to 40 Years of age that is Eligible to Contribute under the APY Scheme. However any Candidates of an Statutory Social Security Schemes that is Not Eligible to get the Government Contribution for the Atal Pension Yojana Scheme but here he/She will get all Normal Benefits of Atal Pension Yojana APY. 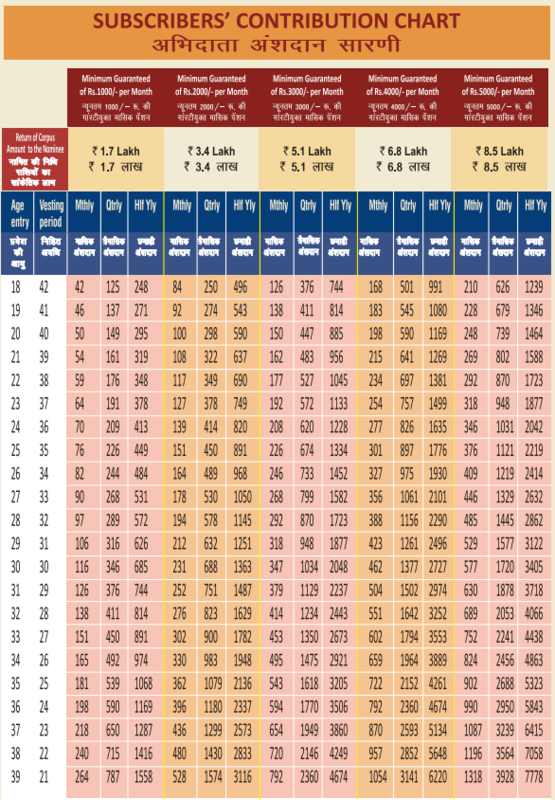 As if Your age is 40 Years then you are Eligible for this APY Scheme but if you are 40 Years and and Just 1 Days is Higher then You are Not any more Eligible for this Atal Pension Yojana Scheme. Aadhar Card will be Primary KYC, Aadhar and Mobile Number that are recommended to be obtained from the Candidates for he Easy of Operation of this Schemes. If not the Aadhar Card Available at the time of Registration the Aadhar Details may also be Submitted Later the Scheme Initial Stage. The Government of India has Started and Concerned about the Old Age Income security of Working Poor and it is Focused on encouraging and Enabling them to Save for their when the time of Retirement. To address the Longevity risks that among the Workers in Unorganized Sector and to Encourage the Workers in Unorganized Sector to Voluntarily Save for their Retirement of Candidates who are apply for the Atal Pension Yojana Scheme. The Government of India Moreover they have announced an New Scheme that is Called Atal Pension Yojana APY in the Year 2015-16 Budget Session. The APY is totally Focused on all Citizens in the Unorganized Sector across India wide. Also this Scheme is Administered by the Atal Pension Fund Regulatory and Development Authority PFRDA through the NPS Architecture. Under this APY there is an Guaranteed Minimum Monthly Pension for the Candidates of He/She ranging between Rs. 1000 and Rs. 5000 Per Month. The Government of India will also Co-Contribute 50% of the Candidates Contribution or Rs 1000 Per Aunnum and whichever is lower Government Co-Contribution is available for those who are not covered by any Statutory Social Security Schemes and it is Not Income Tax Payers. GOI will Contribute to Each Eligible Subscriber for an Period of 5 Years that who Joins the Scheme between the Perios 1st June 2015 to 31st December 2018, Then the Benefit of Five Years of Government Co-Contribute Under APY that would Not Exceed 5 Years for all Subscribers that Including Swavalamban Beneficiaries. All the He/She Bank Account Holders Can Join in this Scheme APY. If the Candidates Need any more Information regarding the Atal Pension Yojana they can visit the Official website check the details that You want to Check.